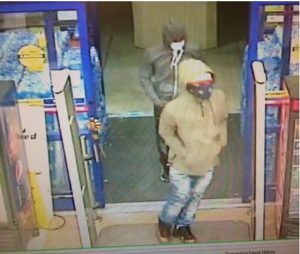 On October 2, 2017 at 11:33 p.m. officers responded for a commercial robbery at the Rite-Aid located at 1712 Crain Highway in Glen Burnie. Store employees told police two suspects entered the store, implied they had weapons, and jumped the pharmacy counter. The males removed several items from the pharmacy and then fled the area in a dark colored vehicle. Officers searched the area however were unable to located the suspects. No injuries were reported as a result of this incident. Anyone with information on the suspects can submit a tip to Metro Crime Stoppers by calling 1-866-7-LOCKUP or submit a tip by clicking here.